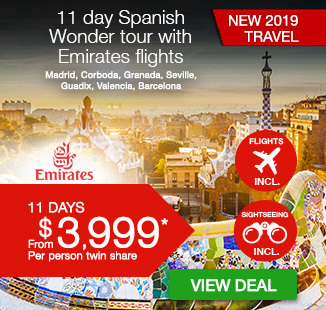 11 day Spanish Wonder tour with Trafalgar, including return international Emirates flights, airport transfers, breakfast daily, escorted tour guide throughout, dedicated, air-conditioned transportation, in-depth sightseeing and more. Bienviendo! Madrid awaits you as the first stop of your 11 day Spanish Wonder tour. Relax in the lush surrounds of Buen Retiro Park, wander the cobblestoned streets of Toledo and admire the beauty of the Plaza de España. Journey to La Mancha and visit the Mosque of the Caliphs, learning about the centuries of Moorish rule. 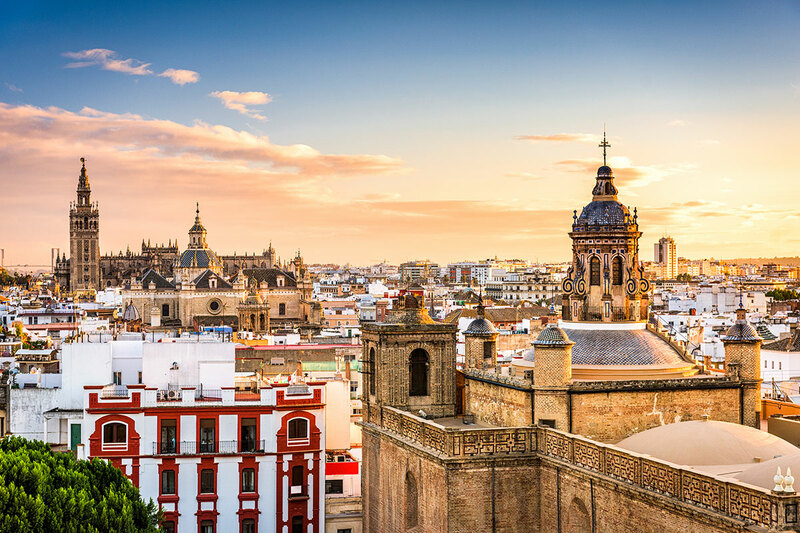 Travel to the city of Seville and explore Christopher Columbus’ ornate tomb within the cathedral, before participating in an incredible dinner at a local olive farm. 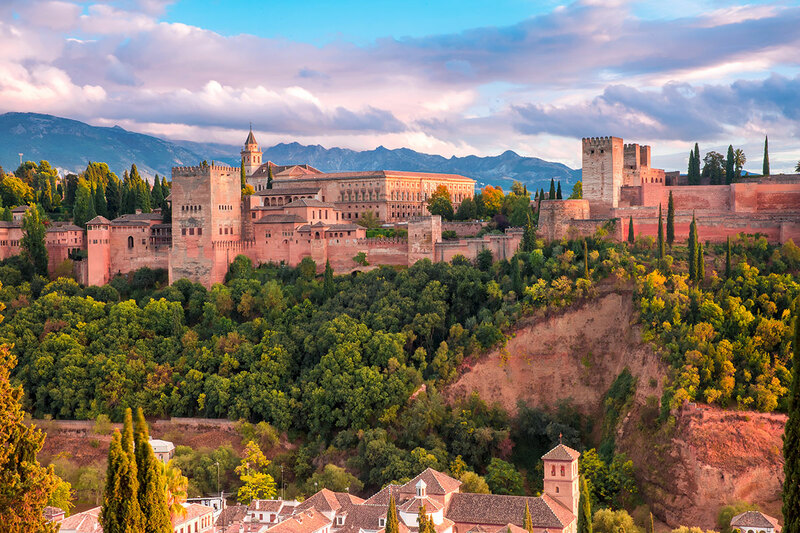 Visit the magnificent Alhambra Palace in beautiful Granada, before travelling to Valencia where you will witness the incredible Bullring and admire the medieval architecture of the town. 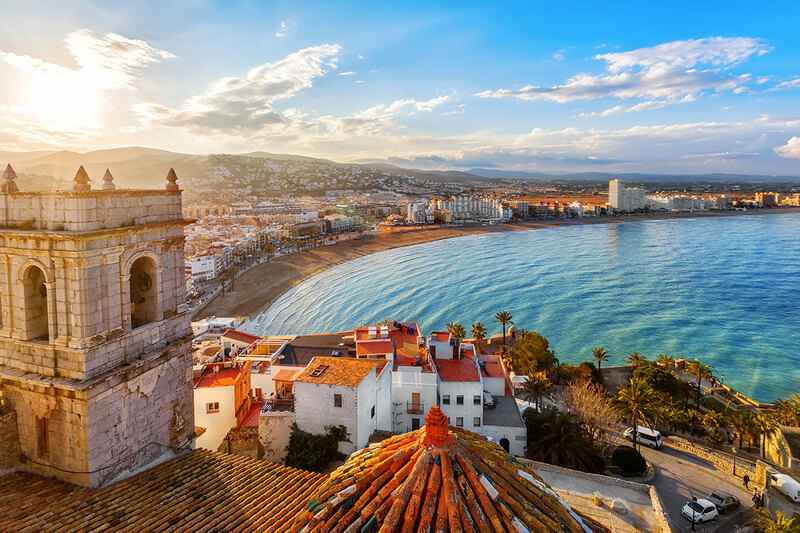 Explore the ancient castle of the ‘Spanish Pope’ in Peñiscola and journey to the incredible city of Barcelona where you will wander and explore all this city has to offer. Enjoy a final farewell dinner before your flight home. Depart Australia today to begin your journey of Spain. Bienvenidos a Madrid. Upon arrival at the airport, take a group transfer to your hotel (please refer to the Fine Print section of this page for important transfer details). The lively capital of Spain is our launchpad to a memorable encounter with one of Europe’s most soulful destinations. 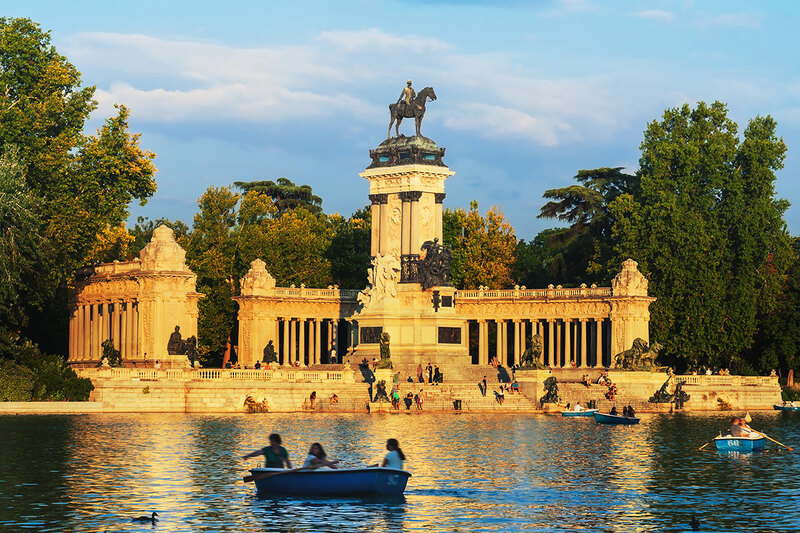 Relax in the lush surrounds of Buen Retiro Park, shop up a storm on Gran Vía or people-watch over coffee and napolitana con chocolate in Puerta del Sol. This evening join your fellow travellers and Travel Director for a fiery Welcome Reception, followed by an orientation drive to see some of the city’s most iconic sights. 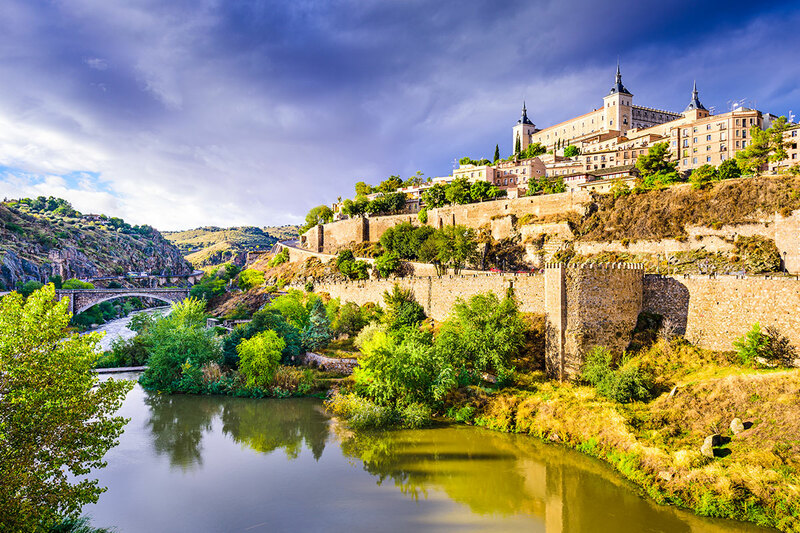 We head to Toledo, the former capital of Spain, where we join a Local Specialist for a walking tour of this city that dates back to Roman times. We’ll visit a traditional factory to gain a Cultural Insight into the age-old steel craft before seeing one of El Greco’s most famous paintings – ‘The Burial of Count Orgaz’ – in the Church of Santo Tomé. We’ll also visit the synagogue during our guided walk through Toledo’s winding cobblestone lanes. 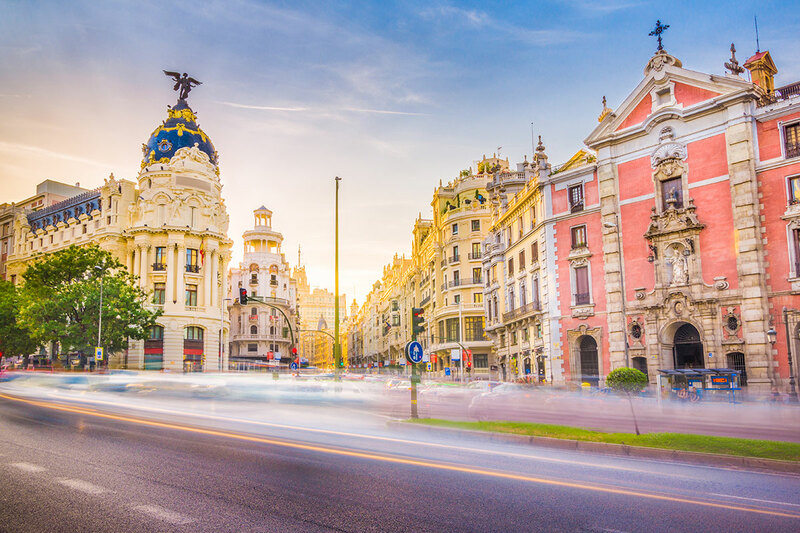 We return to Madrid to admire the monument to Cervantes and Don Quixote at the Plaza de España and see Puerta del Sol, the city’s hub with our Local Specialist. Spend your evening at leisure delving into the delicious flavours of Spain’s tapas capital, or perhaps join your newfound friends for a traditional Spanish dinner. Optional Tour (additional cost applies): Dinner and Discovery in Old and New Madrid. This evening you’ll have the chance to admire the elegance of Madrid’s new city, with its wide, tree-lined avenues and decorative fountains, before you experience the flavour of the old. Join the locals in a chat, and people-watch as you sip an aperitif before enjoying a delicious dinner. 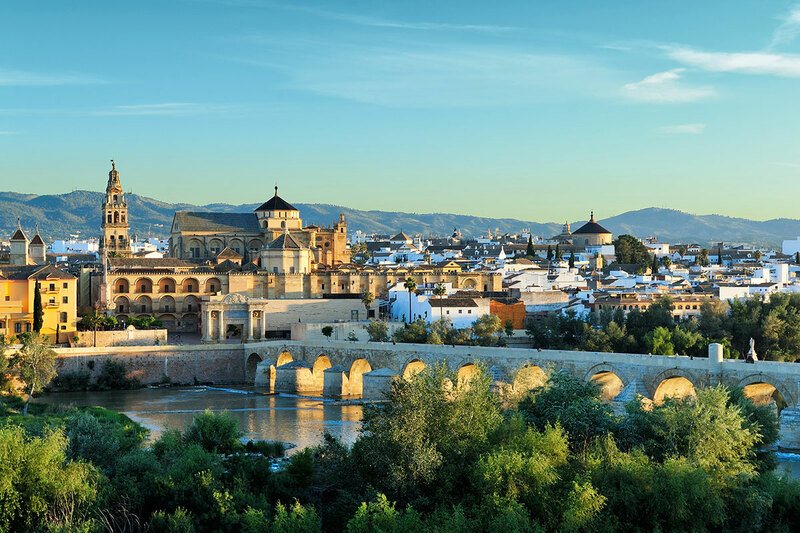 Journeying south through La Mancha, we arrive in Córdoba, once a significant Moor settlement. 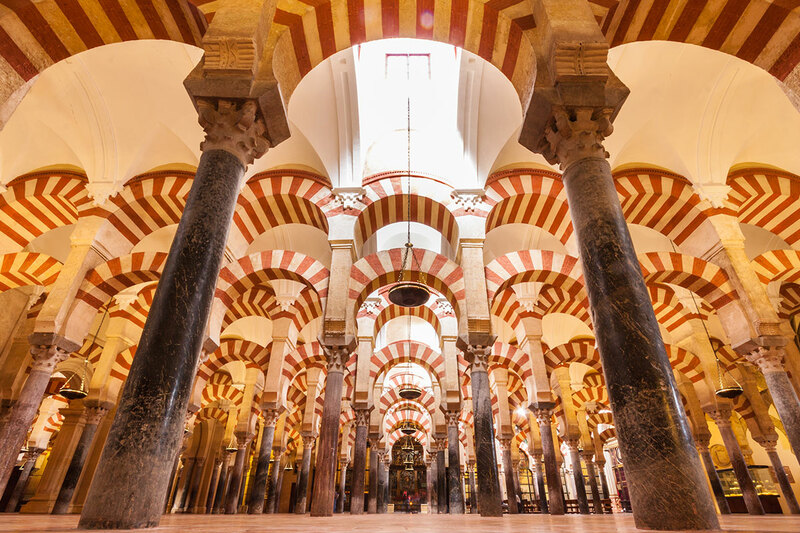 Join a Local Specialist to visit the Mosque of the Caliphs and learn about centuries of Moorish rule and its influence on the culture and architecture of the region. We travel to flamboyant Seville, our home for the next two nights. Consider an Optional Experience to see the colourful twirling skirts of a fiery flamenco or rub shoulders with the Sevillanos in search of delicious tapeo and wine. Optional Tour (additional cost applies): Flamenco: Experience the Best Show in Town Discover the passion, rhythm and magic of an Andalusian flamenco show with us this evening. We’ve organised tickets to the best show in town, where you’ll experience 90 minutes of memorable entertainment with an included drink. This morning we meet our Local Specialist for a sightseeing tour of Seville. 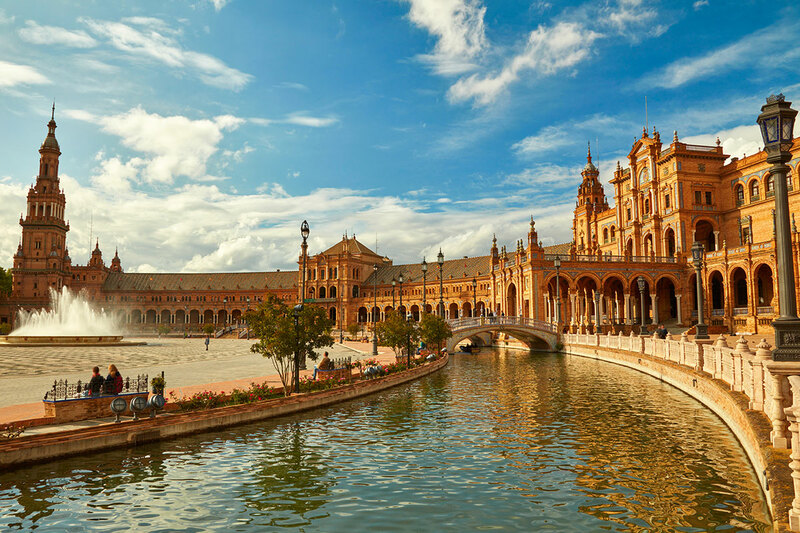 View the symbolic Bell Tower of the Giralda, see the Moorish-inspired Maria Luisa Park with its tiled fountains, pavilions and ponds, and walk through the imposing Plaza de España. Marvel at Christopher Columbus’ ornate tomb in the cathedral, then take a walk through the former Jewish Quarter. This evening, we join the Morillo family for a unique Be My Guest dinner at their olive oil mill where you learn how oil is produced from the 6,000 trees and get to sample some of their produce. Multicultural Granada takes centre stage today as we visit the magnificent pink-hued Alhambra Palace in the company of a Local Specialist. A fine example of Moorish architecture, the Alhambra was built during the 14th century towards the end of Islamic rule in Spain as a palace, citadel and the home of the Nasrid sultans. Wander through the exotic water gardens of the Generalife, the royal Summer Palace, once linked to the Alhambra by a covered walkway across the ravine, and admire the intricate design and detail around every turn. Optional Tour (additional cost applies): Albaicín And The Royal Chapel. Enjoy a leisurely walking tour through the Albaicín World Heritage Site – a maze of narrow streets and Moorish splendour. You’ll get to explore the Catholic Monarchs’ tombs and some of their treasures at the Royal Chapel, and stop off at the picturesque Alcaicería quarter. This morning we journey via the Mora Pass to Guadix in the northern foothills of the Sierra Nevada mountains where you will see the whitewashed troglodyte dwellings lodged into the ochre-coloured cliffs of the surrounding area. We travel to Valencia, where we will stay overnight to view the Bullring and admire the architecture of its medieval cathedral and the Serrano and Quart Towers. Embrace the city’s spirit of innovation and stop to view the City of Arts and Sciences, a large-scale urban recreation centre for culture and science, designed by Santiago Calatrava. This evening dine at your hotel and take to the vibrant streets of the Old Quarter. 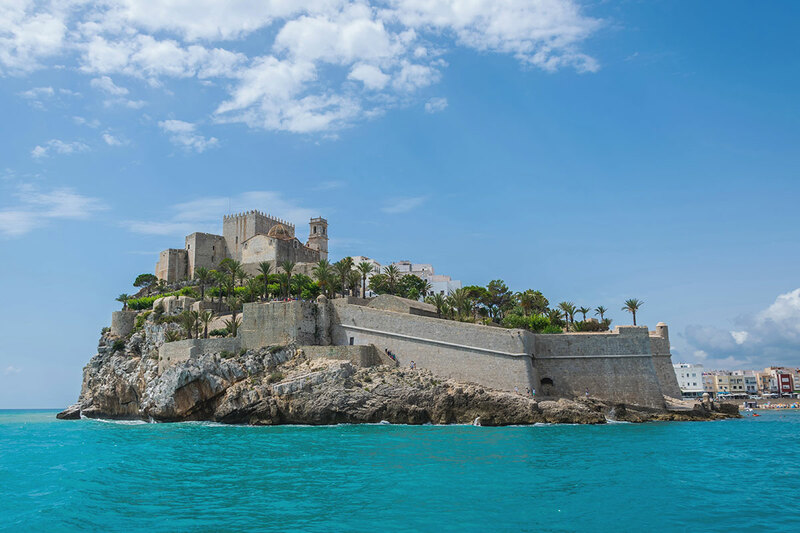 Head north along the coast through the Levant region and stop at Peñiscola, the City in the Sea, to view the ancient castle of the ‘Spanish Pope’, built by the Knights Templar and used in the film, ‘El Cid’. We meander along the Costa Dorada to beguiling Barcelona with its whimsical Gaudi architecture which we will have an opportunity to view in the unfinished La Sagrada Família Cathedral, which has been under construction since 1882. Stroll up Las Ramblas, see the Plaça de Catalunya and pay tribute to the great discoverer, Christopher Columbus with your Local Specialist. Take a trip up Montjuïc for panoramic views of this enchanting city. The evening is yours to embrace the charm of Barcelona. Ramble through El Born for delicious tapas, or consider visiting a Catalan-style restaurant for a delicious dinner of local specialities. Optional Tour (additional cost applies): Catalonian Dinner And The Dancing Fountains. 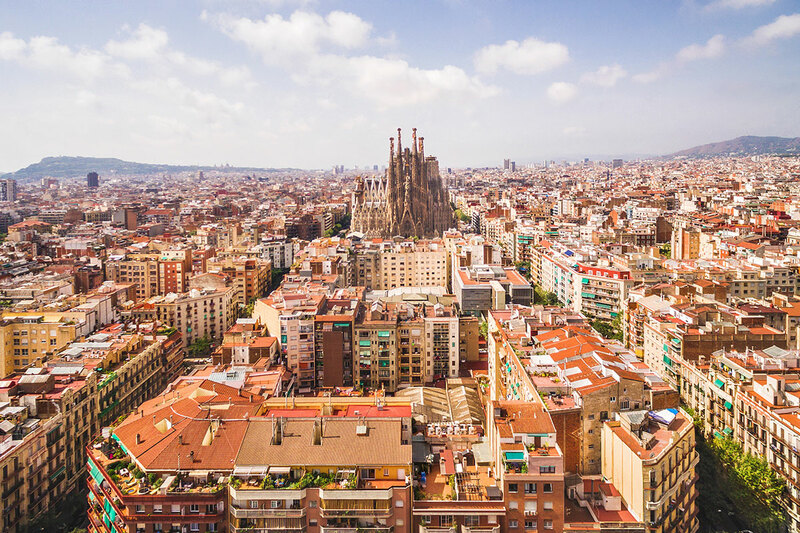 Join us for drinks and a Catalonian feast in the bustling city of Barcelona. After dinner, we’ll take you to see the spectacle of the famous Dancing Fountains, which were built for the 1929 World’s Fair and are one of the wonders of the modern world. Explore centuries of history, contemporary culture and exquisite art and architecture on your day at leisure. 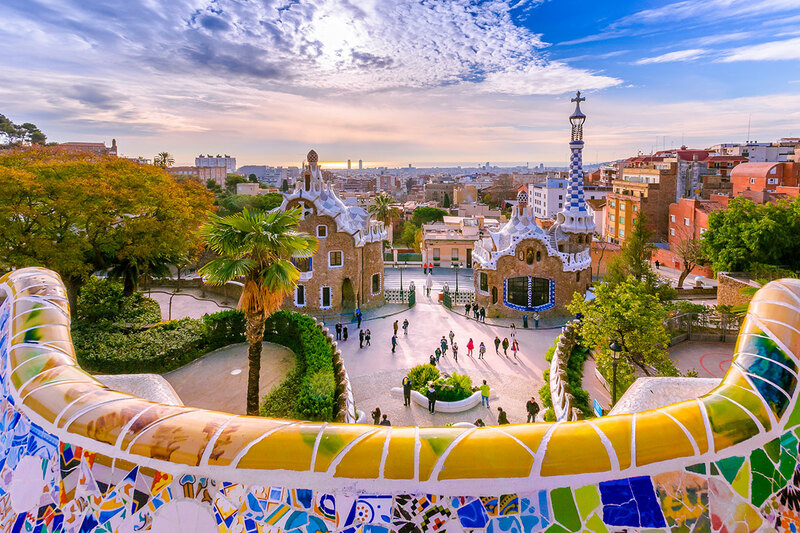 Visit Gaudi’s fairy-tale Park Guell, ramble through the enchanting Gothic Quarter or join an Optional Experience to the monastery perched atop Montserrat to see the mystical Black Madonna, the patron saint of Catalonia. This evening, we celebrate a memorable journey through Spain with our newfound friends and Travel Director at a special Farewell Dinner with wine. Optional Tour (additional cost applies): Mystical Montserrat. Join an Optional Experience to the enchanting and mystical mountain of Montserrat, with its breathtaking views and spectacular scenery. There we will visit the Benedictine monastery where the Black Madonna can be seen. For now it’s a sad adios to Spain at the end of a memorable holiday. Group transfers to the airport are available for your homeward flight. Pending flight departure times, you may wish to make your own way to the airport and spend a few more hours exploring the city (please refer to the Fine Print section of this page for important transfer details).